Move the cursor to the Date field in the next empty row of the register (if it isn’t already there) and type the date by using MM/DD format. To enter August 31, 2015, for example, type 8/31. You usually don’t have to type the year because Quicken retrieves the current year number from the little clock inside your computer. You can adjust the date in a Date field by using the + and – keys on your keyboard. The + key adds one day to the current date; the – key subtracts one day from the current date. Move the cursor (or tab) to the Check # field and type the check number. Alternatively, move the cursor to the Check Number field and then, when Quicken displays a list box of entries (such as ATM, Deposit, EFT, Next Check Num, Print Check, Send Online Payment, and Transfer), select Next Check Num if you want. Quicken then fills in the number with its guess as to the new check number — one more than the preceding check number you entered. If this guess is right, you can just leave it in place. If it isn’t right, type over what Quicken guessed with the correct number or use the + or – key to increase or decrease the check number. Move the cursor to the Memo field, and describe the specific reason that you’re paying the check. You may identify the cable payment as the June payment, for example. If you’re using Quicken for a business, use this field to identify the paid invoice — usually by entering the invoice number you’re paying. You don’t have to enter anything in this field, by the way. Move the cursor to the Category field. Quicken displays a drop-down list box of category names from your category list. You can select one of these categories by using the arrow keys or the mouse. Or, if you’re the independent type, just type the name yourself. For example, if you use the standard Quicken categories list, you may categorize a payment to your cable company as Bills & Utilities:Television. The first part of this entry, Bills & Utilities, is the category. The second part, Television, is the subcategory. If you go with the typing approach and you’re not a super-fast typist, Quicken can probably guess which category you’re entering before you enter it. When you start typing Bi, for example, Quicken fills in the rest of the category name — lls & Utilities for you (Bi + lls & Utilities = Bills & Utilities). This feature is called QuickFill. If you decided to use tags and have turned this feature on, you can also enter a tag in the Tag field. Just to make this a bit clearer, suppose that you’re using tags to segregate expenses by house because you actually own two homes: your principal residence and a cabin in the mountains. If you’ve set up two tags — principal and cabin — you record utilities expenses for your principal residence by entering utilities in the Category field and principal in the Tag field. You record utilities expenses for your cabin by entering utilities in the Category field and cabin in the Tag field. Move the cursor to the Payment field, and type the check amount — 85.95 for this example. You don’t have to type the dollar sign, but you do need to type the period to indicate the decimal place and cents. Click the Save button that appears in the transaction’s row of the register. This option tells Quicken that you want to record the transaction in your register. 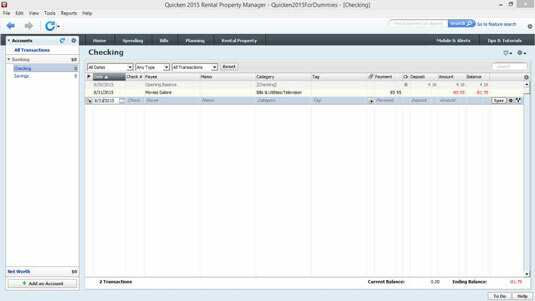 Quicken beeps in acknowledgment, calculates the new account balance, and moves the cursor to the next slot (or row) in the register. The figure shows the cable television check recorded in the register. You can’t see it in this black-and-white figure, but the $81.79 in the Balance field is in red after the $85.95 check is recorded. This red number indicates that you’ve overdrawn your account. That means verdraft charges.